Premier satellite provider DISH Network was founded in 1980 and currently delivers satellite television, satellite Internet access, audio programming and interactive television services. They’re responsible for 13.9 million television and 628,000 broadband subscribers across the United States. 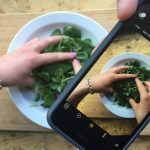 In order to successfully launch a slew of new services and products, DISH sought us out to increase their social media engagement and gain customers. 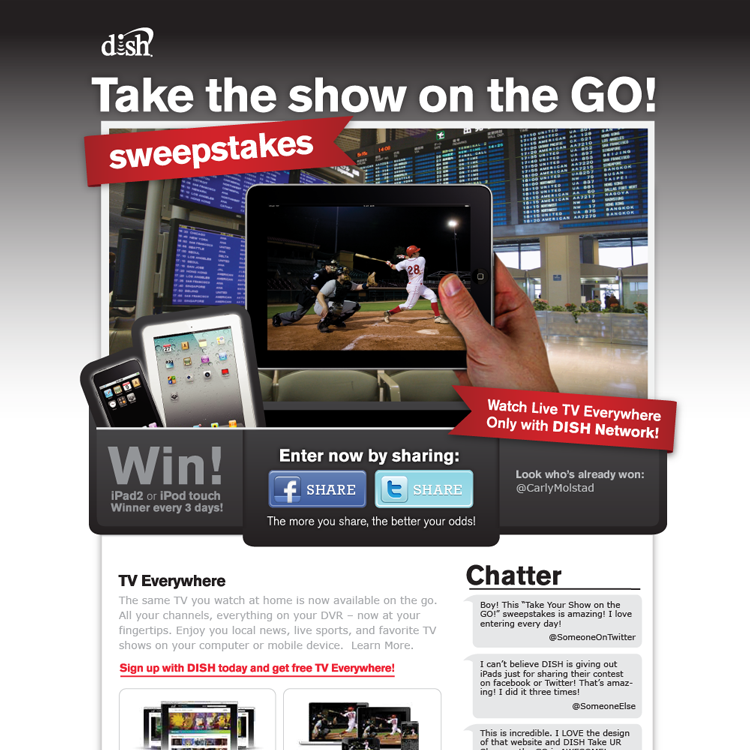 With DISH looking to increase social engagement and customer acquisition while promoting its then-new service TV Everywhere, we developed a social media sweepstakes called “Take the Show on the GO!” This sweeps implemented a simple microsite with a one-click solve for entering contests that used the Facebook and Twitter sharing functionality to drive impressions and awareness. But “Take the show on the GO!” was just the beginning. 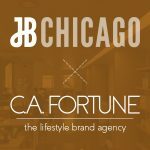 The success of that campaign lead to JB Chicago becoming DISH’s agency of record and kickstarted a long and successful relationship – one filled with brand-building, engagement-based, conversion-focused, online campaigns. 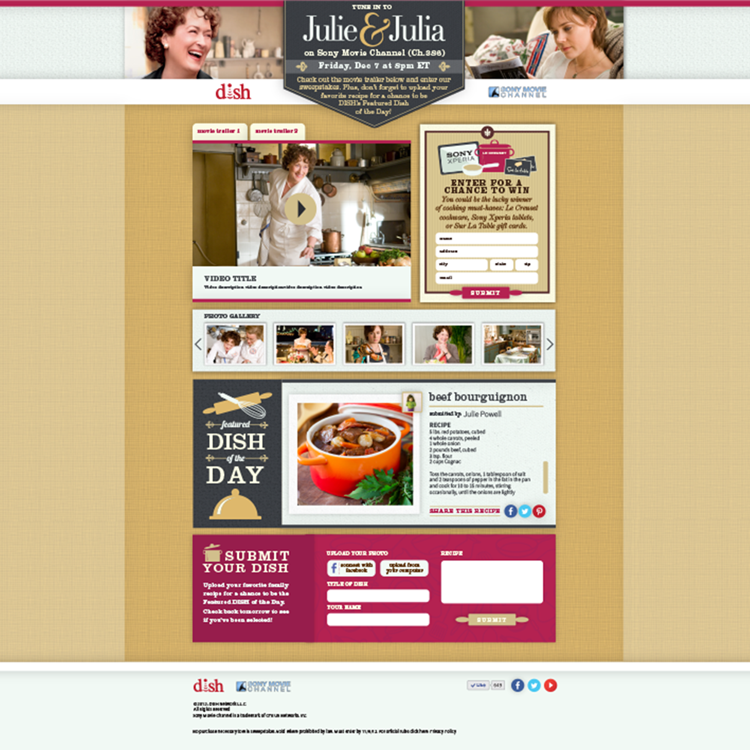 Below are some of our favorite campaigns we developed for DISH. 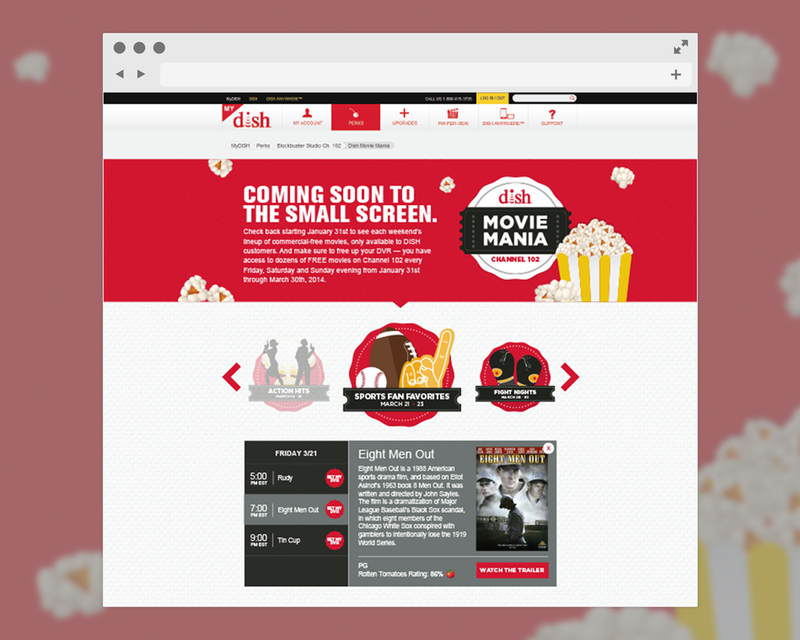 Impressed by our work on their social campaigns, DISH took our relationship a step further and had us develop multiple websites dedicated to customer appreciation. 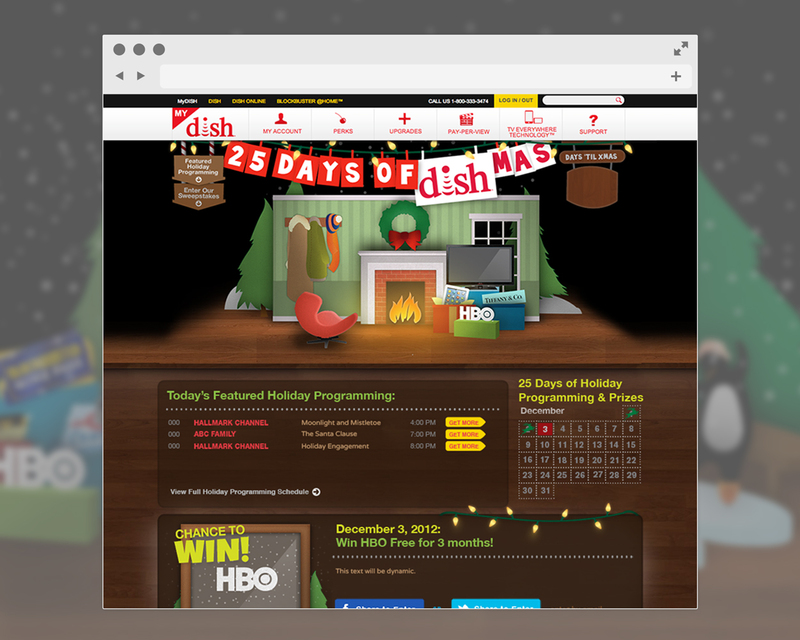 We also developed sites that introduced Hopper, DISH’s new HD DVR system and mascot. When DISH wanted to launch a campaign thanking its loyal customers with Christmas gifts, we crafted 25 Days of DISHmas. 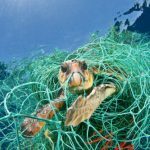 Subscribers could enter for their chance to win prizes like Tiffany’s jewelry, TVs and free HBO, which DISH gave away daily throughout the campaign via Facebook and Twitter. We designed the microsite to include illustrated holiday scenes and a Christmas countdown. 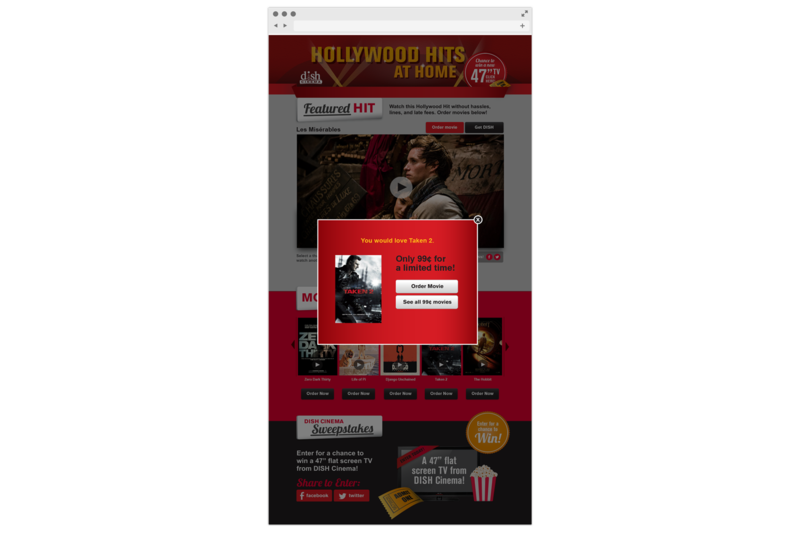 We also showcased the month’s featured programming, making it a one-stop shop for holiday movies and gifts. 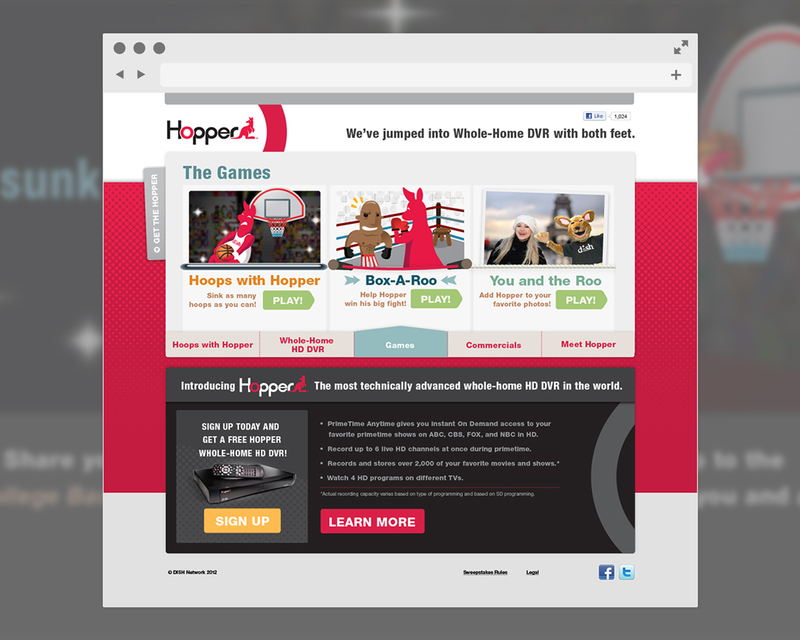 The campaign helped launched the new DISH mascot, Hopper the kangaroo, online, while promoting the home HD DVR system of the same name. We developed the roo’s persona and built interactive games that lived within a microsite and on a Facebook tab. Users’ game results were automatically posted on Facebook, increasing the impressions and overall engagement numbers. 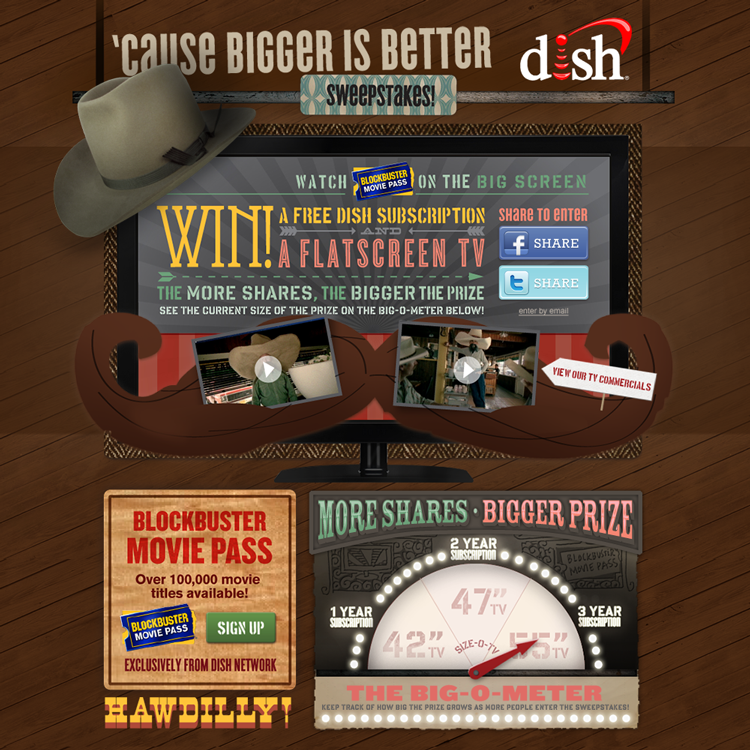 In an effort to show customer appreciation, DISH offered commercial-free movies, served up by themes like Westerns, comedies, family favorite and more. 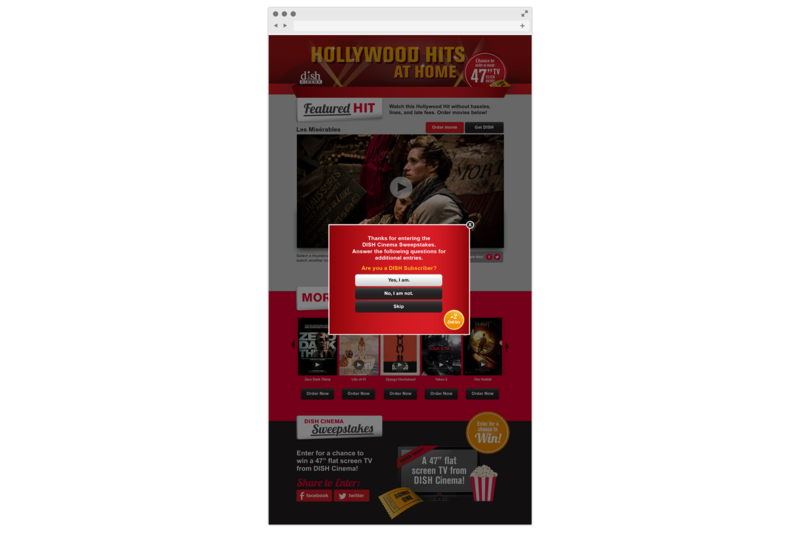 We developed a site that housed a calendar of upcoming movies so viewers would never miss their favorites, and also enabled them to set their DVR directly from that calendar. 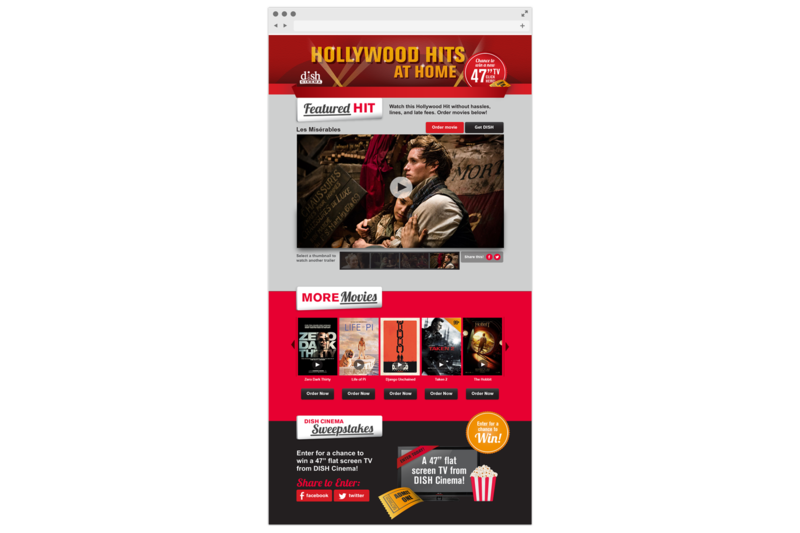 DISH was looking to promote DISH Cinema, which allows users to catch the newest movie releases, so we developed the Hollywood Hits at Home campaign. 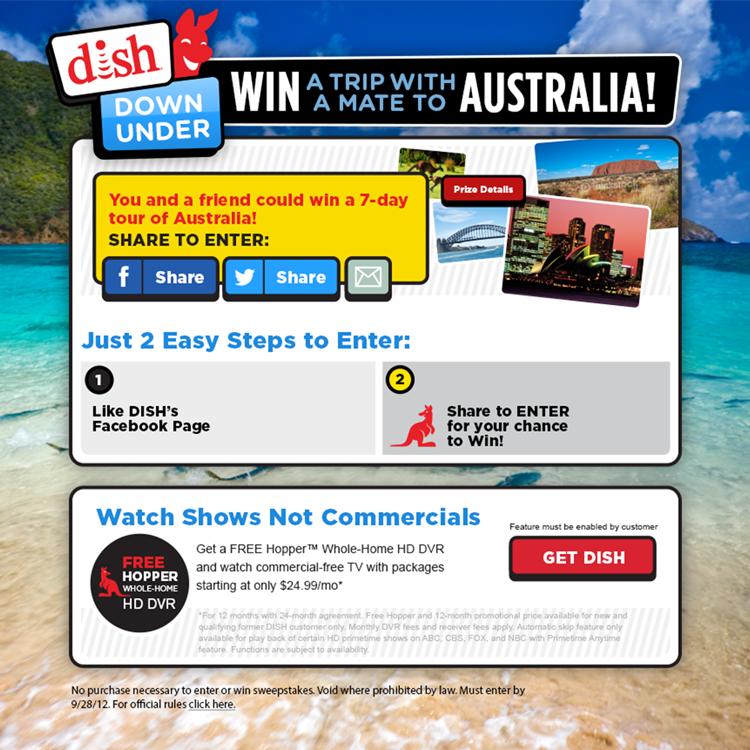 This included a Facebook and Twitter sweepstakes where users could enter for their chance to win multiple prizes, and along the way, they answered additional questions to get additional entries in the sweeps – kicking in a CRM system that allowed DISH to find out more about users’ preferences. 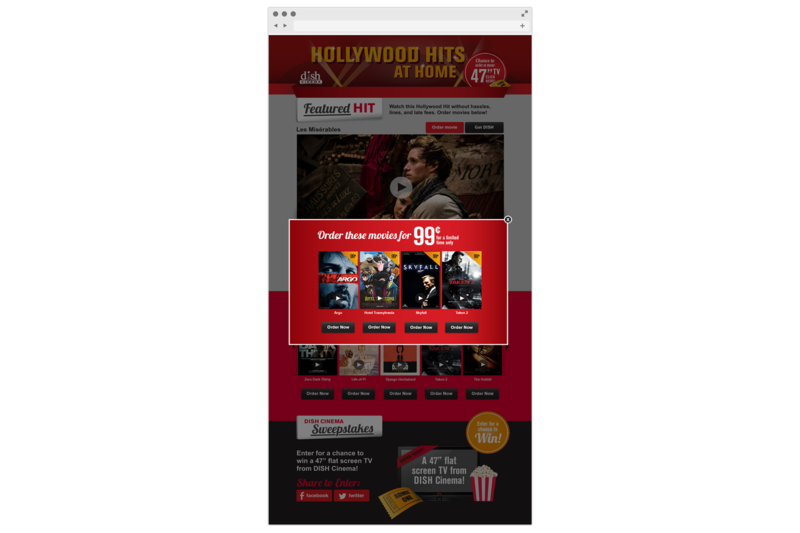 They could also order movies straight from this site. 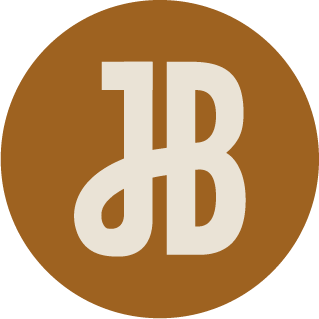 Additionally, through a robust backend system, the clients were able to make on-the-fly changes on their own.